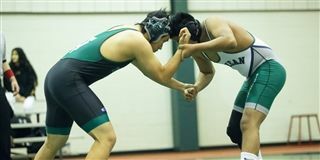 The Tower Hill wrestling team hosted the annual Tower Hill Invitational on Friday, Jan. 18, and won the team title by a comfortable margin. Ky Jacobs '20, Ted Hughes '19, Blaine Boyden '20, Brian Brown '19 and Richie Pierce '20 all won individual titles at their respective weight classes. The event is made possible by a strong wrestling community of parents, teachers and volunteers. Hosting our tournament sends an important message to the Delaware wrestling community that Tower Hill supports and appreciates the sport of wrestling. The team is moving into the last two weeks of our dual meet season, highlighted by Friday night spotlight duals against Woodbridge on Jan. 25 at 7 p.m. and Friends on Feb. 1 at 6:30 p.m. Come out and support the wrestling team in our last two big events of the year before state qualifiers!